Staging your home means cleaning and getting ready to show it to potential buyers. Any seller that is trying to sell their home needs to “stage” it before taking any pictures or having anyone come look at it. You must be prepared to sell your home, however, because if someone really likes it and want to buy it, then you have a short time frame to move out. 1. Consider the curb appeal- The curb appeal of your home is the first impression everyone gets. When someone is driving around, looking for those “FOR SALE” signs in front yards, they first thing they look at it is the curb appeal of the home. If it does not look nice, they will keep driving, or not write your number down. Lawns freshly mowed, and landscaping is nice, however, not everyone can afford it. The leaves raked, or snow shoveled. Consider a hanging or potted plant for the entrance. Sweep the porch, deck, and all walkways, and ensure garbage and recycling tucked neatly away from the front of the house. Instead of repainting, scrub the front door, porch, and outside railings and steps. 2. Lose the clutter- Pick out one closet or area at a time so that the task is not as daunting. Look at every item with a very critical eye and ask yourself why you still have it. 3. Watch where the eye goes- If you walk out of the room and walk back in, your eyes will automatically direct to something in the room. This could be something not positioned correctly, or possibly paint chippings, holes in the walls, or if something is out of place. For holes in the walls, if you cannot afford to fix them right away, cover them with pictures or paintings. This is not a solution however; you should fix them later the proper way. 4. Find a fix-it person- If there are any doors, cabinets, or cupboards that need fixed or reframed, you are better off calling in a professional to do the work for you just in case there is a major problem. 5. 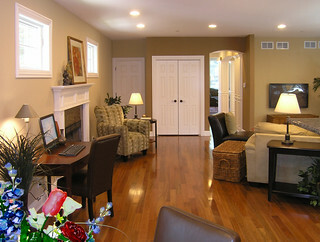 Clean, clean, and clean again- Most people do not live in a spotless environment all the time. This is one of the more stressful aspects of having your home on the market; however, it will be worth it in the end when you sell your home for top dollar. Hiring a professional cleaning service to do a deep clean will start you off, then all you have to do is take the tie to keep it clean, just in case buyers want to take a look. 6. Let in the sunshine- Using natural light to light your home has two benefits: it make the rooms look larger and lessen the electricity bill! Dimly lit rooms tend to look small and dingy, especially during the day. If you have a particularly dark room, purchase a floor lamp, the light will bounce off the ceiling, making your room look larger than it actually is. 7. Leave fresh flowers- You do not have to leave out vases of flowers in every room, however, a nice vase on the dining room table looks nice. Do not use plastic or any other obviously fake flowers. 8. Let fresh air in- Opening your windows for ten minutes each day lets the rooms feel not so stuffy and removes any odors in the home. Author Denis is a passionate writer who loves to assist people through his informative contents on real estate. He is a strong believer of “Success in real estate starts with believing you’re worthy of it”. Great service! Would definitely use them again! Maximum of 1 coupon to be used per job. A minimum call of service for $75 is required unless specifically mentioned that this restriction does not apply. An area is defined as a room up to 12 square meters.